I recently visited my parents home in Seattle and found an old toy ray gun a friend had left there back in high school. It no longer made any laser sound effects but seemed like it could make for an interesting Halloween accessory, so I brought it back with me to Bellingham to attempt to fix it in time for the holiday. The first thing I did was check the battery slot, which was visibly corroded with battery acid crystals. After throwing away the old batteries, scraping out the crystals and putting new batteries in, it still didn’t turn on. The next step was unscrewing the two halves of the gun. Fortunately, the inside was very simple- a circuit board with a few simple resistors, capacitors, and transistors, connected to a small cylindrical soundbox. 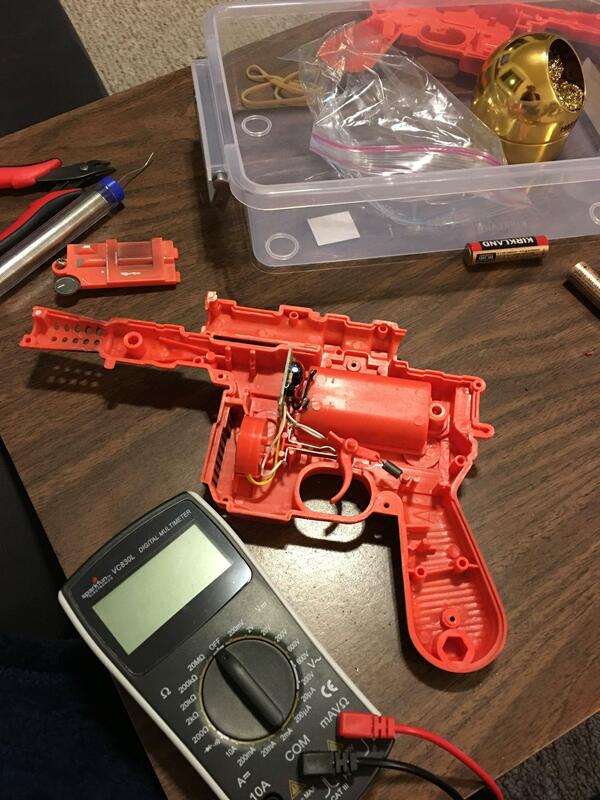 The power went through the circuit board to two small strips of metal that would complete the circuit when the trigger of the gun was pulled. It was cool to see exactly how the gun worked and its simplicity gave me hope that I would actually be able to fix it. The area near the battery slot had some corrosion as well, but the other parts appeared to be fine. The soldering on the board was surprisingly sturdy considering the relative cheapness of the gun. The positive terminal had the worst of the corrosion, so I desoldered that wire first. I was lazy and working with very limited tools, so I attempted to scrape off the grime with wire cutters and re-solder the wire to the still fairly dirty terminal. Predictably, the solder didn’t adhere very well, and when I put it back together the gun still wouldn’t turn on. I sent out an SOS asking if my friends had any ideas, and got a recommendation to use sandpaper to clean the connection. The next day at school I went to the art department and found a small square. When I got home that afternoon I tried using it to scrub off as much of the grime as possible, which worked a lot better than the wire-cutter method. I put fresh batteries in and checked the voltage with my voltmeter. The terminals were transferring power- a good sign that the sanding had worked. 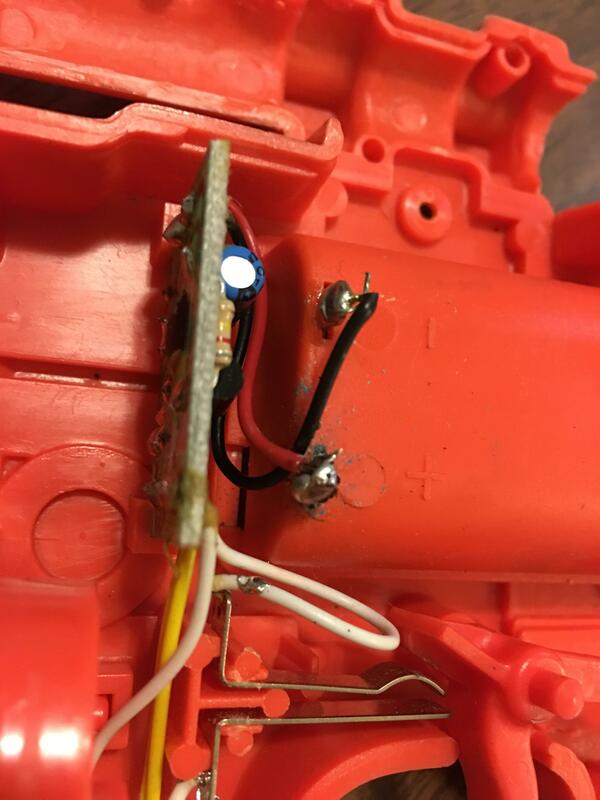 I soldered the wire back on and crossed my fingers for the moment of truth as I squeezed the trigger. Success! The ray gun was in fighting shape once again (set safely to Stun, of course). This was my first attempt at using soldering to fix something broken and it gave me a feeling of accomplishment and competency. Throwing things out when they are broken instead of fixing them is a disappointing reality for most items and even though this was just an inexpensive plastic toy, the skills I learned from working on it will have even more exciting applications later on. Dagmar Knechtel is a student currently studying Computer Science and Organic Chemistry at Western Washington University.